The petunia is a garden staple for its color and long-lasting blooms. Every year, 600 to 1,000 new varieties are developed. There are basically two types of petunias: upright and trailing. The difference is that upright petunias can reach heights of 12 inches or more. Trailing petunias only reach heights of 4 to 6 inches, yet they trail 2 to 3 feet. While most people use the term trailing petunias, climbing, ground cover and spreading petunias are one and the same. Thanks to marketing efforts, hybrids like Wave, Surfina and Kirin have become names synonymous with trailing petunias. Buy your trailing petunias from a garden center or start them from seed. Make sure you select a variety that will only grow to a height of 4 to 6 inches and trail 2 to 3 feet. Read the labels on the plants. It is easy to get distracted by the color and beauty of the flowers. Select a location for your petunias that receives at least 4 to 6 hours of sunlight. Full sunlight is best. Although often used in containers or hanging pots, trailing petunias add color and beauty to a hillside or retaining wall. Most trailing petunias produce flowers that are 2 inches in diameter. At their peak, their green leaves are barely noticeable. Cultivate the soil. Turn the soil over and add peat moss, well-rotted leaf compost or manure if you are planting petunias in the ground. For hanging baskets and containers, mix potting soil, peat moss and perlite for a medium that provides good drainage. Petunias need consistent watering. Most hanging baskets and containers will require daily watering. Plant the petunias following recommended spacing. Placing the plants too close could result in them becoming root bound which will shorten their flowering season and health. Remove any spent or faded flowers. Some growers recommend cutting back newly-planted petunias so they well spread faster and establish their root systems more quickly. Fertilizer once a week with a well-balanced 8-8-8, 10-10-10 or 20-20-20. The University of Minnesota Extension recommends a rate of 2 lbs. per 100 square feet. A liquid fertilizer works well for hanging pots and containers. Deadhead double blooms. Single blooms are self-cleaning and do not require deadheading. 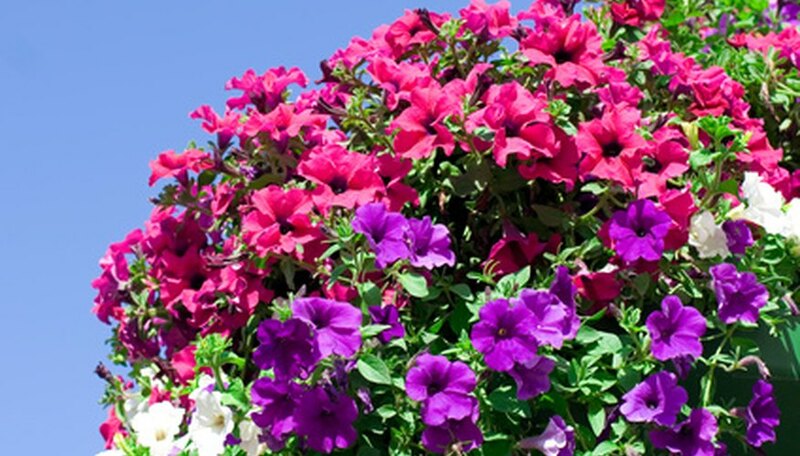 When planting trailing petunias in containers or hanging baskets, angle the plant at 45 degrees to encourage cascading. Do not plant petunias outdoors until the danger of frost has passed. Epinions: Opera Supreme Pink Morn!